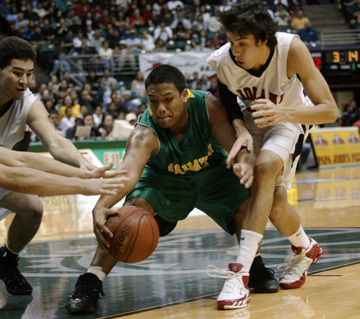 Keone Reyes of Kaimuki held onto the ball as Iolani defenders Jon Takamura and Kawika Shoji closed in on him. Three minutes into last night's state basketball championship game, Kaimuki led 4-0 and Iolani was struggling to find any openings against the Bulldogs' 3-2 zone defense. Maybe this was finally the year the four-time defending state champions would be knocked off their throne. After spotting the Bulldogs those four quick points, the Raiders smothered Kaimuki with a tenacious full-court pressure defense that Iolani has become known for. The Raiders outscored Kaimuki 33-6 over the next 17:24 en route to a 54-41 victory to claim their fifth straight Hawaiian Airlines/HHSAA Boys State Basketball Championship last night at the Stan Sheriff Center. "This team is different from the teams in the past because we've had to overcome a lot more," Raiders guard Vinny Nip said. "This was a rough road." The road wasn't quite as rough last night because the Raiders managed to turn the game into a track meet, forcing turnover after turnover on defense and quickly turning them into easy transition baskets. By the end of the third quarter, Iolani had 10 steals, 16 forced turnovers and 14 points off Kaimuki's giveaways. As a result, Iolani was up 38-19 and already making space in its trophy case for another state title. 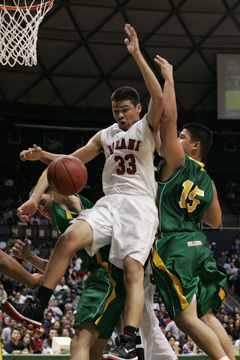 Iolani's Liloa Nobriga collided with a pair of Kaimuki players near the basket last night during the first half. Meanwhile, the Bulldogs finished with more turnovers (19) than field goals (16), but they managed to keep the final margin down by scoring 22 of their 41 points in the final quarter. "They're extremely quick and they all know what they're doing at all times," Kaimuki coach Kelly Grant said. "They get out and play defense and have all the lanes covered. They're so disciplined." Other teams have tried to play the same up-tempo, non-stop pressure defense like Iolani, but no team in the state could match the Raiders' depth, which has been evident all tournament long. In the semifinals against Kahuku, 21 of Iolani's 34 first-half points came from the bench. Last night, Iolani's bench outscored Kaimuki's subs 16-7. "Our bench allows us to go the whole game without losing a beat," Nip said. "We proved again in this year's tournament that we're able to tire the opponent out and still stay fresh." Iolani's recent championship teams were known for having the go-to guy in crunch time -- Derrick Low, Bobby Nash and Kyle Pape, who are all playing in college now. This year's team was void of such a player, although Kawika Shoji, the tournament's most outstanding player, might disagree. But Shoji never found himself in that do-or-die situation. The Raiders were never threatened in the tournament, outscoring their opponents by an average of 19.3 points per game. "I have what I call a trio of three in Vinny, Ryan (Dung), and Case (Miyahira)," Iolani coach Mark Mugiishi said. "When two out of the three of them are clicking, we're a tough team to beat. Last night (in the semifinals), it was Case and Ryan. Tonight, it was Case and Vinny." Nip led eight Raiders who scored with 11 points, and Shoji added 10 points and seven rebounds. Not the most impressive individual game numbers, but all that counts for Iolani is the number eight, as in eight total state basketball championships in the school's history to tie Punahou for the most by one school.